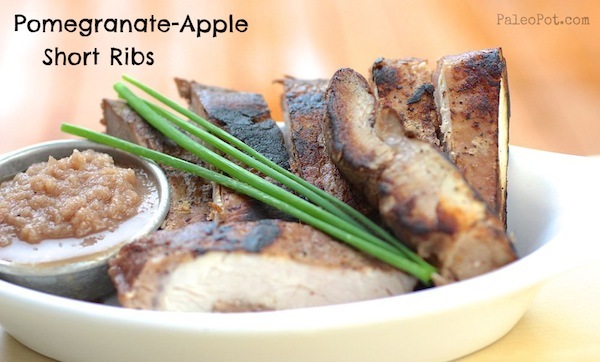 Paleo meals don’t get much easier than this. 5 minutes of prep time and then you’re off while the crock pot works it’s magic! This 3 ingredient recipe is savory and satisfies your needs for protein and high fiber vegetables. 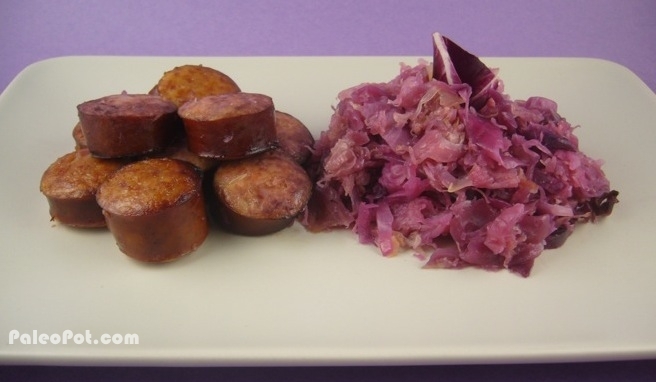 Definitely not your standard Kielbasa and kraut! Red Cabbage – half of one medium head, shredded. 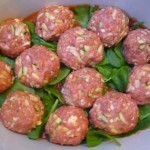 Beef Kielbasa – 1 to 1.5 pounds, sliced into 1/2″ or 1″ pieces. 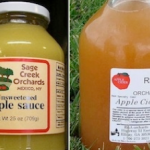 Pour the sauerkraut into your crock pot / slow cooker, including the juices. Add the shredded red cabbage and mix evenly into the sauerkraut. Place the kielbasa (cut sides up) around the edges of the crock pot to form a ring. Use the excess kielbasa slices to start a second ring inside of the first. Cover your crock pot / slow cooker and cook on low for 4 to 5 hours. Eat, enjoy, package the leftovers for tomorrow or the next day. I love this recipe, the red cabbage adds a different flavor and color to the sauerkraut and also gives it a slightly firmer texture. The kielbasa placed around the edges cooks nicely and almost takes on a grilled flavor from making contact with the crock pot. 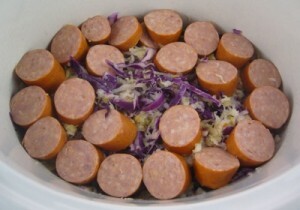 You may find yourself eating all of the delicious kielbasa first, leaving some kraut/cabbage as leftovers. Please save it! The cabbage mixture is a great addition to some cold salads or a stir fry. I personally enjoy eating the cabbage mixture with some bacon crumbles tossed in. 3 ingredients + 5 minutes prep time = delicious and colorful Paleo goodness! This one tastes so good, there’s no need to add mustard or anything else to enhance the flavor. This recipe exemplifies why I love the crock pot / slow cooker so much. 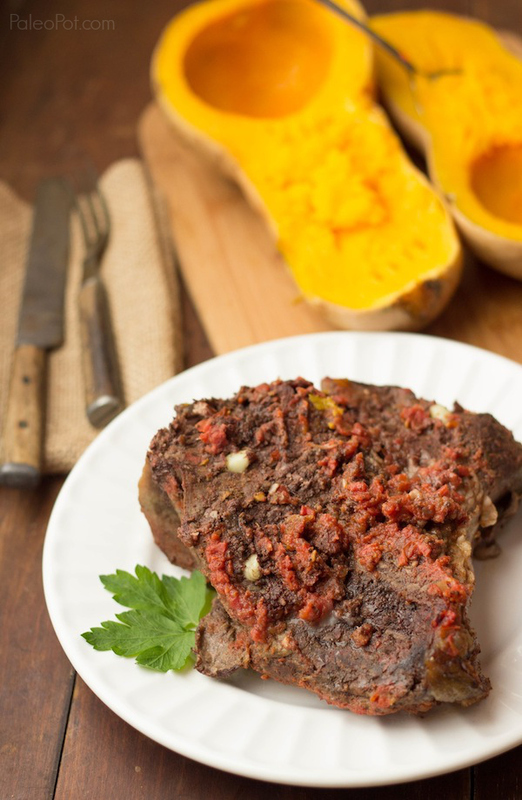 Many say that a lack of time is their biggest challenge in maintaining a Paleo Diet. 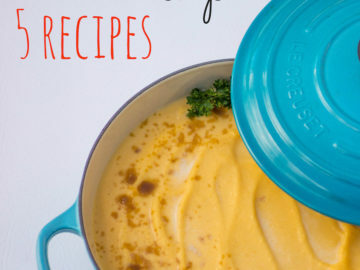 This recipe has become a family favorite! I can vouch for this one. I make it on a regular basis. Very cool. What sides do you like to serve this with? This type of dish I often eat with a side of itself and mustard. Just kidding! Usually this meal gets paired with a salad of sorts beforehand. Think crispy vegetables such as cucumbers or peppers to give a nice textural contrast. Hope this helps. Tried this for the first time tonight. So easy and so delicious – it’s a new favorite! Yum!! This was so easy and yummy! My hubby went crazy over this. The kids however did not but thats okay I am still going to make this at least once every few weeks! Thank you!! Glad you enjoyed it! This is often one of the things I cook on super lazy days. What do your kids like to eat? I’ve been thinking about creating more kid friendly recipes. Just ade this tonight, SO good! I was worried about not adding spices, but it had so much flavor! A smidge of spicy mustard and hot sauce, BOOM! Definitely one of my “regulars” in the dinner rotation. Have not tried adding red cabbage but why not? I add a teaspoon of caraway seeds to mine. Also wondered if anyone has a tried and true source for a healthier beef kielbasa. Looked at them in the store again yesterday and cringe reading that all have nitrates. US Wellness is currently out of stock but has anyone tried theirs? Thanks. Thanks! Good call on the caraway seeds, I’ll have to try that sometime. The red cabbage makes this dish for me, I hope you try it! 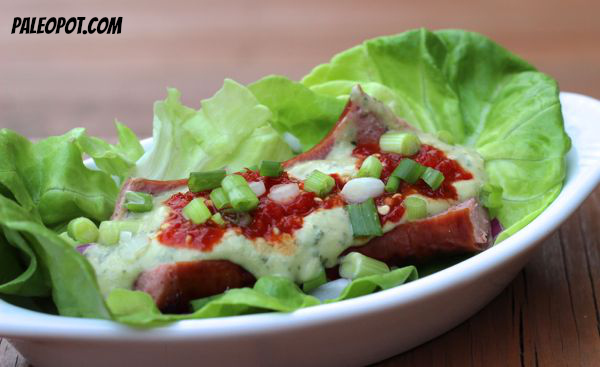 As for kielbasa, I have tried it from US Wellness in the past and it was delish! Where does one find a “bag”of sauerkraut? I have only seen it in jars. In the cooler section of your market, either in produce or the meat section. You can use a jar just as well. This looks delicious. Does the heat not kill the good stuff in the sauerkraut? I like the way you are thinking, but I don’t think Paleo people had sausages. I made this last Sunday for a picnic-style Easter menu, doubling the amount of kielbasa. Got rave reviews from family and friends. Thanks for another big hit! This was yummy!!!! I added a whole onion, bacon bits, garlic, dry mustard, & pepper to the mixture as well. I may have missed it, but what size crock pot do you usually use for this? I’m so excited to try this recipe! I use a 6 quart cooker and base most recipes off of that size, thanks! Any recommendations for downsizing this recipe? I have a 1.5 quart cooker and only cook for myself (and maybe some leftovers). Not familiar enough with slow cookers to figure out how to adjust timing. For this recipe, but the farmers market only had uncooked kielbasa. Should I cook it before i put it in the crock pot? Just slice it, the crock will do the cooking! It seems like it will be very difficult to cut without smashing it. I will give it a try! If that’s the case, I assume it is soft in a soft casing like Italian sausage. If that truly is the case, then you can either brown it in a pan first, or cook in in the pot halfway before slicing. Another option is to try cutting it raw with a large serrated knife. You are such an amazing cook! I loved this recipe too. I’m enjoying reading some of your recipes! I’ve been a huge crock-pot person, it makes some of the best meats!! Thank you for sharing! One question – I’m always in fear of not putting in enough liquid – You don’t use any in this recipe? That will be a first for me. We are trying hard to get our three middle school/late grade school children invested in cooking and choosing better options. This will be a good one for them to put together. Any other child friendly ideas? The liquid in the kraut will be sufficient. If you think your kraut does not have much fluid, you can add a half of a cup to a cup of water to your cooker to be safe. This recipe sounds AMAZING, especially since my mom used to make cocktail weenies in saurkraut for me as a kid and it’s a super nostalgic flavor combo for me. But I’m worried that heating up the saurkraut will kill all the wonderful probiotics? It would if you used live kraut that you fermented yourself. For this type of recipe I simply use regular jarred kraut. I save my live kraut to eat as-is. It is in the crock pot right now. I cannot go into the kitchen because my mouth starts wattering at the door! 2 hours to go… I may not make it.